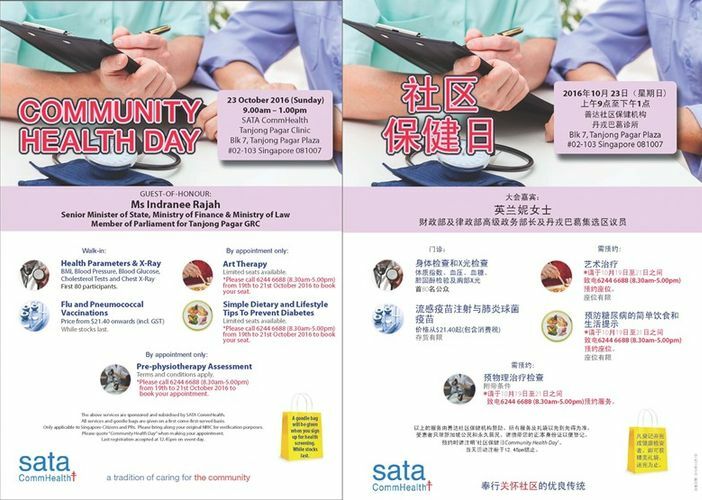 SATA CommHealth is providing free health screening services for Tanjong Pagar residents at its community outreach event, Community Health Day, on Sunday 23 October 2016 at its Tanjong Pagar clinic. The free services available at the event are X-Ray and health screening which includes BMI (height & weight), blood pressure, blood glucose, cholesterol tests, pre-physiotherapy assessment and Art Therapy talks and a talk on simple dietary and lifestyle tips to prevent diabetes. Call for booking of seats. Terms and conditions apply. Every participant who completes the screening will receive a goodie bag. Flu Vaccinations @$21.40 onwards (including GST) and Pneumococcal Vaccinations (chargeable) are available while stocks last. The above services and goodie bags are limited to Singaporeans or Permanent Residents only on a first-come-first-served basis. Participants are advised to bring along their identity cards for registration.